Okay, so here’s where I am: The strategy is working with ATM templates. It takes the first arrow after a color change. I have also started creating a GUI for managing the strategy parameters outside of the built-in Ninja strategy inputs area. This is because we lose the saved real-time data like EOTSVCommitPaintBar every time we load, modify or restart the strategy. The strategy starts over, but the chart plot stays, causing them to no longer be trading the same thing. The new GUI is vital to make sure we can start the strategy in the morning at the same time as the chart, and leave it alone all day so that they match. This has also been the biggest delay item as I had to reverse engineer part of the Ninja Chart API through trial and error and deal with inserting my form classes into the Ninja namespaces. 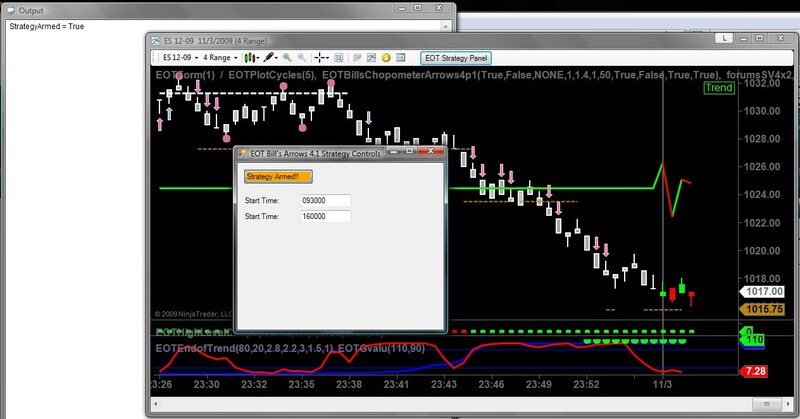 Basically, when you load the AutoTrade strategy on a chart, it will create a button on the toolbar (see example on the chart toolbar, called “EOT Strategy Panel”). This button will open the Auto Trade Strategy Controls (see example form floating over the chart). You can minimize the controls, move them around, etc. If you close the control form, then clicking the toolbar button brings it back, but resets the control states. The control form will let you specify if the strategy is armed to enter trades (or disarmed–just watching), as well as a start time and an ending time. Not yet finished are options to take only longs, only shorts, or entries in both directions, as well as the ATM strategy template to use. I will also be able to add custom inputs as the need arises for individual projects. I still have to build the rest of the GUI, hook up the inputs to the strategy and do some testing, but the hard part is over (I hope). I should have a release before the end of the week. Thank you very much for your patience with this very delayed process. My schedule and learning curve have not been cooperating, but it looks clear from here! Over the past month, I have subscribed to the EoTPro indicators and trading room. I have always been impressed with Richard Todd’s work with them, and they have a great trader in Bill Dennis. I subscribed for two reasons: to try to learn something for my own trading, and to have access to the indicators so that I could write trade automation code for Ninja Trader around them. On the first reason, I learned that I’m still not thinking clearly when it comes to my own personal trading, but I saw firsthand that it is possible to be consistently profitable. On the second reason, I found a whole new opportunity to do custom code development for Ninja. So I’m excited to announce that I am working with EoTPro to develop automation strategies that utilize their indicators. That’s great news for me, and also for you if you’re an EoTPro subscriber and want to automate trading methods using their indicators. I’m still ironing out the particulars, but I’ll post more details on the blog as they happen. I’m also still developing very much part-time, so progress is slower than I would like it to be. You can always email me if you have questions in the meantime. So thanks again to all my readers, donors, and customers, both old and new. I appreciate your support!